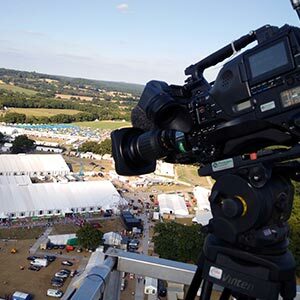 There are loads of differences in the requirements for say news, sport or live entertainment events, and it's digging a little deeper into those differences that ultimately, well, makes the difference in what cameras and lenses we hire out to customers. It's a bit of a cliche, but what customers want is not always what they need. Add to that all the parameters of the ancillary technologies they need (such as¦.) and there is a lot to consider. It's not just order taking and shipping, it's having the stock - more on that later - ensuring it is serviced and ready to go 24 hours a day, and planning for the future, which has become a tricky game in its own right in recent years. For now, though, let's stick with camera and lens requirements. We have a huge range of equipment at Presteigne Broadcast Hire. We want to and, what's more, we have to. We do have basic camera kits that includes lenses, tripods, etc for the OB, news, and event markets, which had tended to be our bread and butter in terms of camera hire. However, we also have an RF Department which has shown substantial increases in business as customers have become aware of the improvements and creative possibilities of RF-based camera and associated transmitter kit. As a result, the hire of wireless camera kit is proving to be a significant growth area. We do quite a large variety of work here, which means there's a large variety of existing cameras, transmitters and ancillary kit to stay across as well as new technologies that come onto the market that need to be evaluated and tested to ensure we're providing the very best technology for a certain application. However, the very latest technology may not always be the best for a particular task at hand, as some have found to their cost. It's our job to ensure that the right kit goes out the door at the right time, which is why we typically ask a lot of questions to be sure every consideration is addressed, which can save a lot of grief for everyone involved. Each job, and each type of equipment, has its own set of questions to be asked when you're taking a booking. For example, when we hire out a camcorder that is going to be used for a big box lens, in order to put the box lens on the camera you have to remove the two-inch monocular viewfinder from the camera and use a side mount plate so the cameraman can monitor the camera. If he doesn't get that, he can't use the camera. It's that simple. Sometimes and order comes in when the question of the use of a box lens is not asked and we end up having to send viewfinders, side mount plates, and other bits and pieces out in super-quick time. It's no good having the correct equipment if a tiny bit of the equation is missing, rendering it unusable for some silly little oversight. Again, that's why we ask so many questions up front. Fortunately, we've been doing this for 25-plus years, so we know what questions to ask. Sometimes we just get told what to ship. It's those where we can soon expect questions coming back the other way. But we never, ever, say "Told you so." That's not good for anybody's business, but more importantly, we've made a reputation out of removing occasional bullets from misplaced feet, and we take pride in it. And then of course there's just, you know, times when someone calls and says, "I want a box lens" and we say "Well, we have an 86 to 1 or a 95 to 1 or 100 to 1. We need to know specifically what type of lens you're looking for." As for cameras, first and foremost, we need to explore exactly how they plan to use them and then work out precisely what they need from there. A number of people ring up to book cameras and don't necessarily know what they really need, or sometimes don't know what to ask for, but again that's where our experience comes into play. They've often been told to "get this" without really knowing what "this" is or why it's needed, but it's our job to talk them through that process. Asking deeper questions is especially important when it comes to wireless RF camera equipment. In addition to the technical requirements, we need to know precisely what locations they're planning to use them so we can find out what frequency ranges are available for those areas and secure OFCOM licenses. This is particularly important if it's a last minute project at, say, Wembley Stadium. If it's a last minute project, it's questionable whether there'll be any frequencies left to license. So RF kit in particular needs to be booked as far in advance as practical. We typically find that about 30-60 days is usually sufficient. However, a large part of the broadcast business is, by its very nature, last-minute. People suddenly realise they don't have enough kit, or they've simply forgotten a small, but crucial, interface. Again, that's where the value of experience, plus the fact that we have such a huge range of stock, provides many practical and intangible benefits. What often happens is that an OB company gets a larger job than they had anticipated, which requires them to assign in-house equipment to that job and then call us to cover their additional requirements. We'll get a list through saying, "This is what we need, now" and it's our job to either make it available from our stock or secure it for them from other sources. However, we sometimes spot discrepancies that need to be clarified, particularly if the person sending through the list is not particularly technical. Some phone up and say "I want RF cameras" full stop. That's fine if the job isn't urgent. It's a bone crusher if it is. However, we usually respond with a shopping list tailored by our experience and any grey areas usually get resolved quickly from there. That kind of support, both on the desk and on the job, is a massive thing for us that we take very seriously indeed. Someone can be reached 24/7 and, if not immediately, someone will phone back within 20 minutes. It's something we've always prided ourselves on. There have been times when I've needed to outsource specialist or additional equipment and I've rung companies, often only slightly out of normal business hours and, I promise you, nine times out of ten I would never even get a call back. Needless to say, I've never called them back, either.